Wed, Feb 6, 2019, 12:00 am SL Time, ColomboPage News Desk, Sri Lanka. 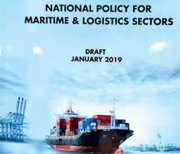 Feb 05, Colombo: The final draft of the National Policy for Maritime and Logistics Sectors which was presented to Ports and Shipping and Southern Development Minister Sagala Ratnayaka will be tabled before Cabinet in early March. The Secretary to the Ministry of Ports & Shipping and Southern Development Dr Parakrama Dissanayake presented the final draft of the National Policy for Maritime and Logistics Sectors to the Minister Sagala Ratnayaka on January 31. The National Policy for Maritime and Logistics Sectors has been drafted to understand the importance of a national policy for the alignment of maritime and logistics sectors to reap the benefits towards the development of Sri Lanka. The draft document comprehensively detailed the strategies, suggested actions and coordinating role of each party while addressing the urgent requirements of the maritime and logistics sectors in Sri Lanka. It has addressed the several areas of the subject including, Ports and Related Infrastructure; Development of Maritime Related Services; Ships, Ship Owning, Ship & Crew Management, Shipping & NVOCC Agency, Coastal Shipping ; Development of Logistics and Intermodal Infrastructure, Harmonization of Regulatory Framework ; Maritime Safety, Security, Marine Pollution Prevention, Maritime Training; Promotion of Small & Medium Scale Enterprises in Maritime and Logistics; Restrictive Practices in Maritime and Logistics. According to Dr. Dissanayake, one of the aims of this national policy is to encourage sustainable port development to cater to long-term forecasted growth in volumes of imports and exports and transshipment trades by sea, with a competitive and efficient port industry capable of meeting the needs of importers and exporters in a cost-effective and timely manner, thus contributing to long-term economic growth and prosperity of Sri Lanka. The Government Information Department said a period of one month from today has been reserved to gather feedback and make amendments to the draft policy. It is being distributed among industry representative bodies, stakeholders and will also be shared on the SLPA website for the general public to view.